Queenstown’s Bathhouse Restaurant: A Unique Place for a Spot of Tea — . There are few structures in New Zealand that are over a century old. This is in stark contrast to the Middle East, Asia and Europe. Even the United States, a relative newbie to the world scene, has many buildings that are two to three times older than any found here. One of New Zealand’s “grand ladies” is The Bathhouse. 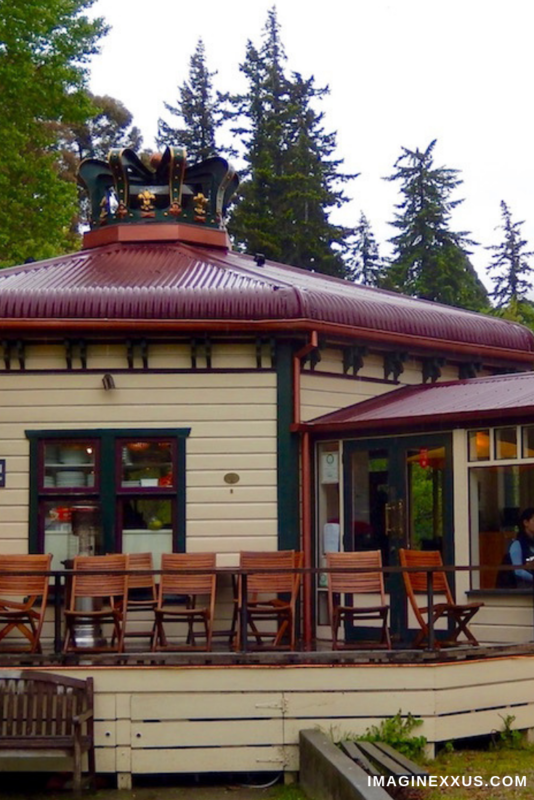 This octagonal building was constructed in 1911 along the edge of Lake Wakatipu and finished with a literal and figurative crowning touch to honor the coronation of King George V. It first served as an elaborate changing facility for those who wanted to swim. Throughout the decades the place has undergone a number of transformations. Once it was a popular teahouse. Next it became a home for the local rowing club and then an architectural studio before it was reconverted into a restaurant, complete with a sunroom. We found it to be the perfect spot to warm up on a misty afternoon and enjoy a cuppa (cup of tea) while watching a handful of boats sail in and out of the wharf. If you enjoyed this story in our series, you may also enjoy two other stories about Queenstown including a walk along the Moonlight Track and a luge ride with an unforgettable view. We also invite you to check out the books in our series.